I am so happy to be here today! I met Beth over the summer and she is just so warm and funny and super talented, but I guess you all already know that! I’m honored that Beth has invited me to share our home by the sea with you. My name is Danielle and my blog is Finding Silver Pennies, where you’ll find me painting furniture (I’m a little addicted), sharing recipes, delving into easy crafts with my kids that usually don’t require much measuring (because I don’t really like doing that, but don’t tell anyone) and of course sharing my love of old things and the ocean. Brrr! Come on inside our home, it is freezing out today! This is our home. 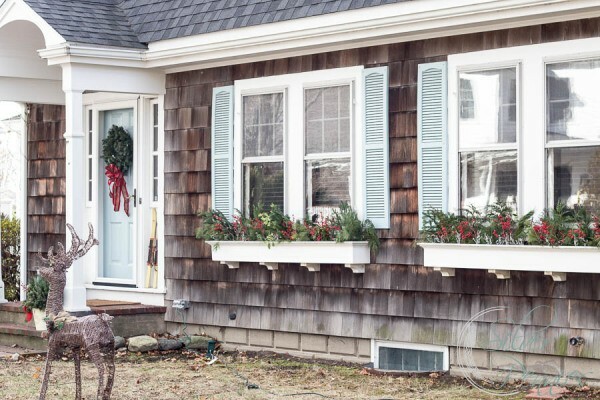 It is a 1927 Dutch colonial in Scituate (pronounced Sit-u-it) a little seaside town on Boston’s south shore. I share this home with my husband, our two little boys and our little dog, Poppy, who is as close to a little girl as I’m getting. My style is simple and easy. Running after this lot, I like to keep things less complicated. 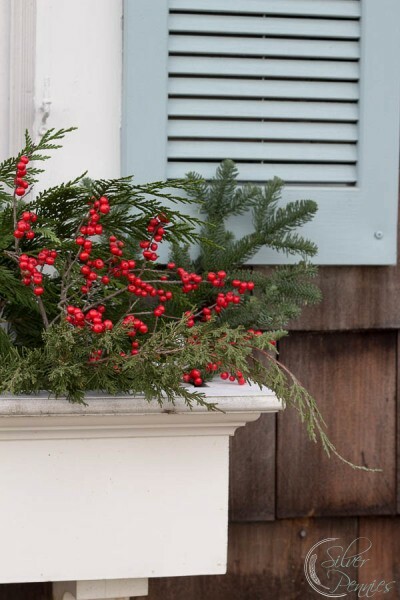 The exterior of our home is decorated with fresh greenery in the window boxes and on the steps. The holly is stunning! Painting the shutters and door was one of the first things we did when we moved in. 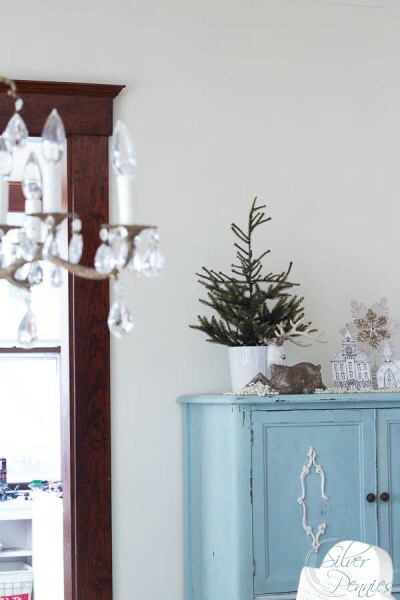 Blue is my favorite color and you will see little pops of it through out our home. On this very spot, I fell in love with our historic home. 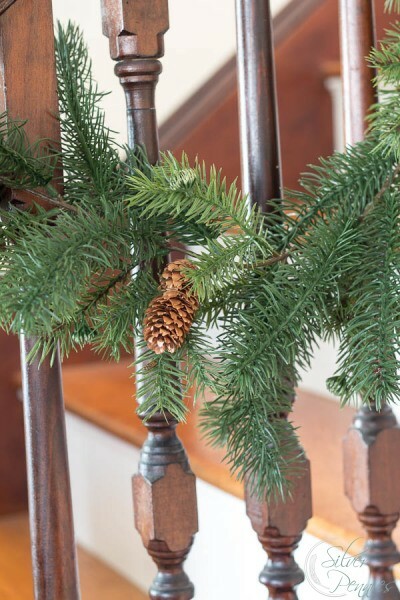 The dark wood work was milled in Maine and is what makes our house a little different. 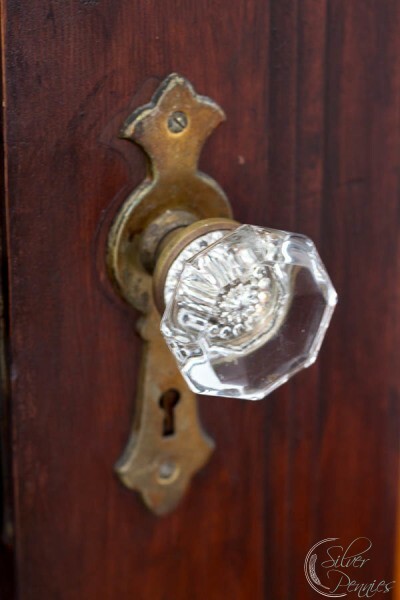 The crystal door knobs are on every door in our home. My grandmother had these in her home and I always thought they were magical. Now, that I have them in my home, well, I still think they are pretty magical. I’ve set up this little bench in our entry for the kids to pull on their boots. It is vintage and I hand painted it in milk paint. These are John’s new boots and I can hardly believe his feet are almost my size! Shall we start with the living room? It is right off the entry to the right. 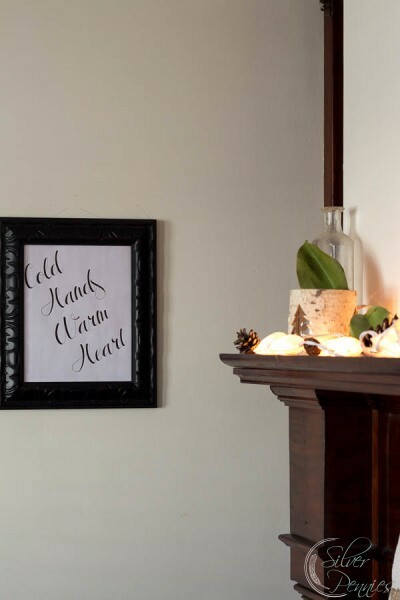 I created this free printable for a hot chocolate bar we had for the boys. 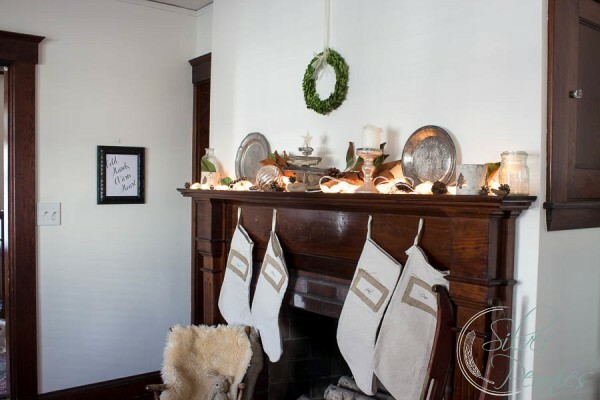 The mantel is decorated with vintage elements, sea shell lights and magnolia leaves. This year is the first time I’m using magnolia leaves and I love them! 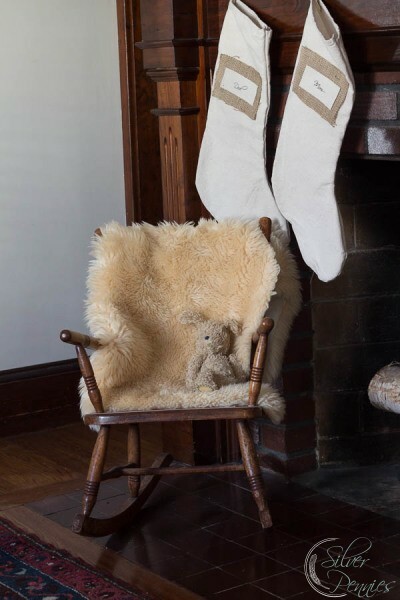 Stockings are hung by the chimney with care! We made these last year. The little rocking chair that Conor’s dog rests on was my mothers. It is over 70 years old and I love its worn appeal. Our home is our little treasured nest and it is important to fill it up with items that hold meaning and treasured memories for us. This time of year is so amazing filled with wonder and magic. My little boys are both so excited for the holiday that we’ve been doing lots of crafts to embrace the Christmas spirit. 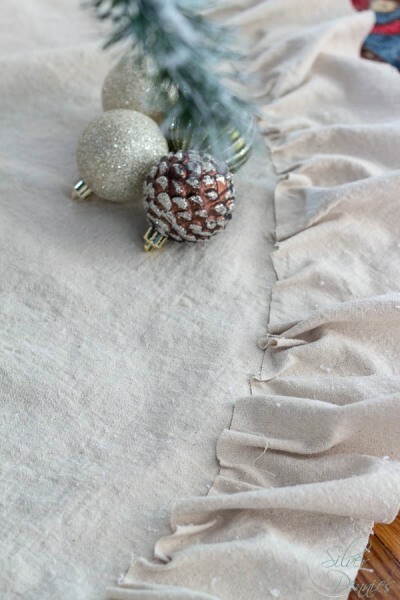 I created a no sew drop cloth tree skirt this year (I ran out of time last year) and I love how it came out! It was so easy! As I told you, I don’t really like to measure much so…. We got a new tree this year. This one is flocked and is from Lowe’s. 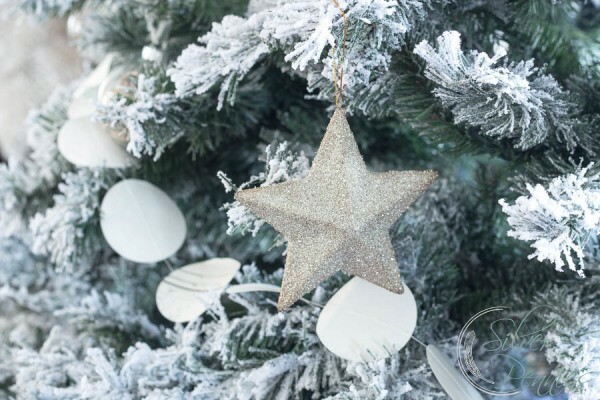 The tree is decorated simply with mostly handmade ornaments and the German glitter glass stars pick up the light when the tree is on. 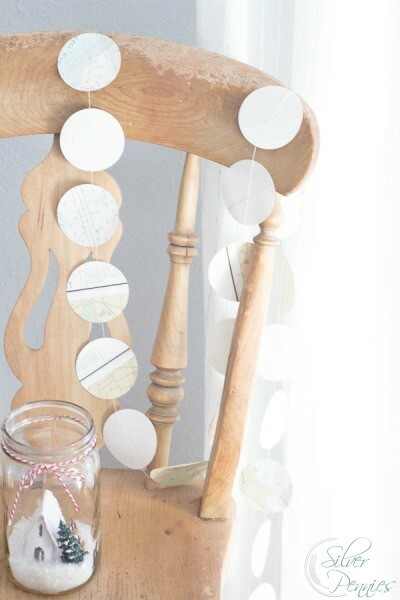 A nautical garland made from old nautical charts is another easy peasy craft. 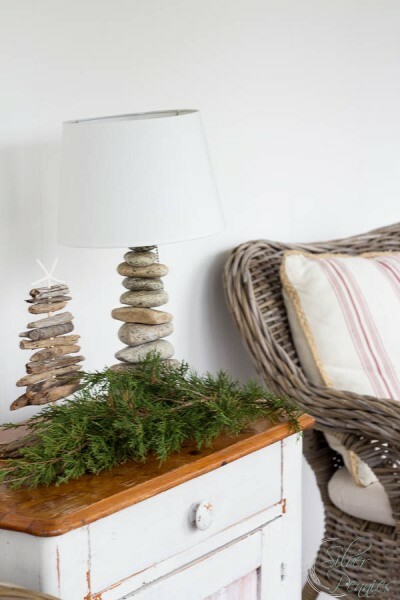 The rest of the living room is decorated simply with little touches of the coast. 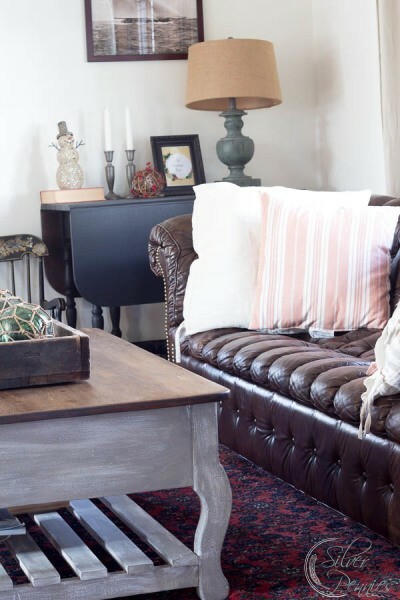 My chesterfield was a lucky craigslist find and I painted the coffee table in the Restoration Hardware style. 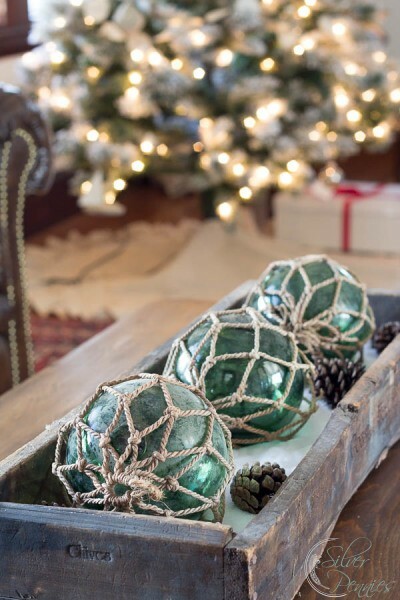 A vintage herb crate is filled with Epsom salt and antique floats. This is a comfy corner in our living room. I love sitting here with a cup of tea or coffee and snuggling my little guys. 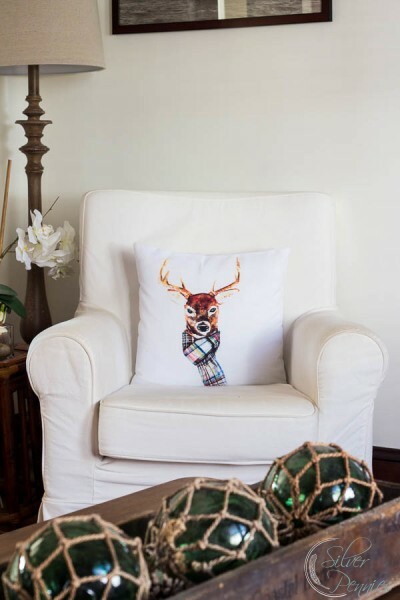 The adorable pillow is by the very talented Lucy over at Craftberry Bush. Through columns is our dining room and this is one of my favorite rooms in our home. This was one of the first rooms we painted when we moved in. 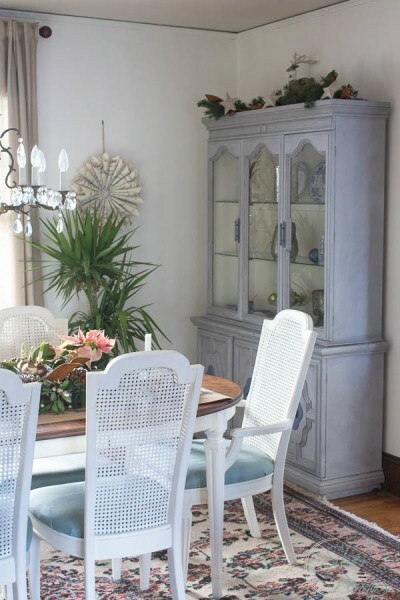 Since I don’t have a HUGE budget many of the items in the dining room were thrifted or found on freecycle. 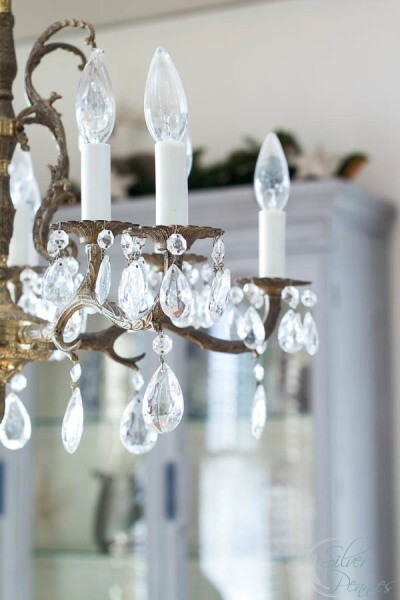 The most expensive item in the whole room was the brass and crystal chandelier and it was worth every penny. 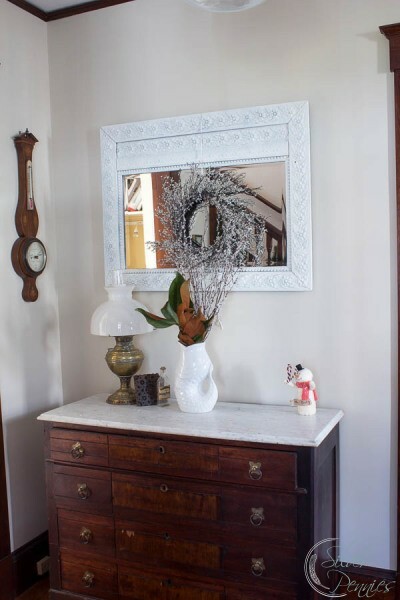 Like the crystal knobs this piece has a little magic in it too! Rainbows dance around the room , like in the movie Pollyanna! 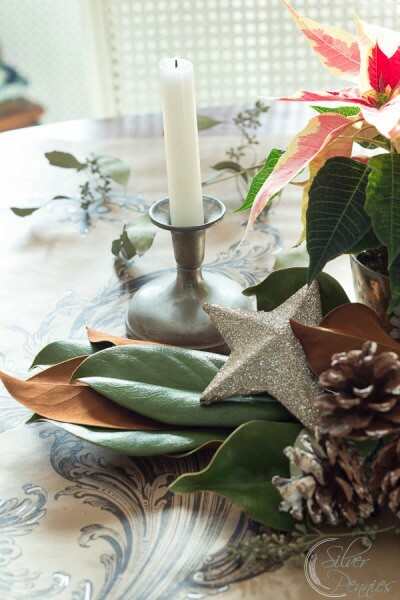 The table itself is decorated with a paper runner, pretty poinsettias and baubles. 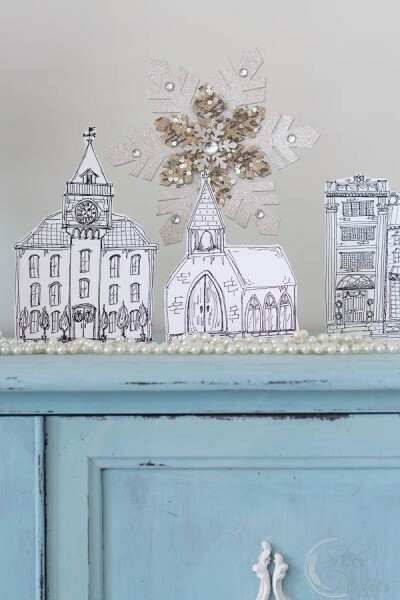 This Christmas, I scattered pearls to look like snow beneath the printable village my friend Alice, over at Thoughts from Alice, created. A german glitter glass deer lays by an Ikea tree. 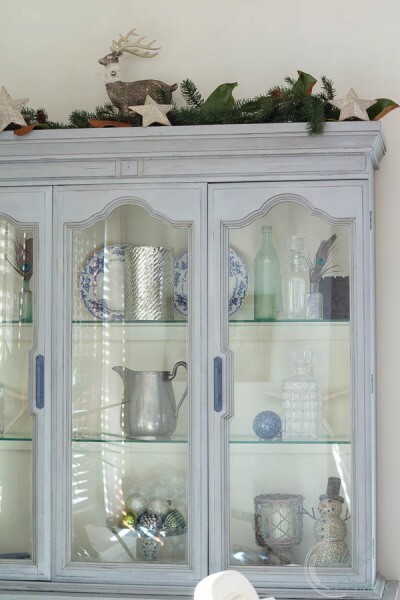 My gray hutch is filled with ornaments and some shells. We haven’t done much to the kitchen yet so we’re going to walk through that room out to the sunroom. We tackled this room in May, after our dog got sprayed by a skunk. It wasn’t a fun experience but so happy to have a pretty room now. This is a three season room so a little too cold to sit out here most days. 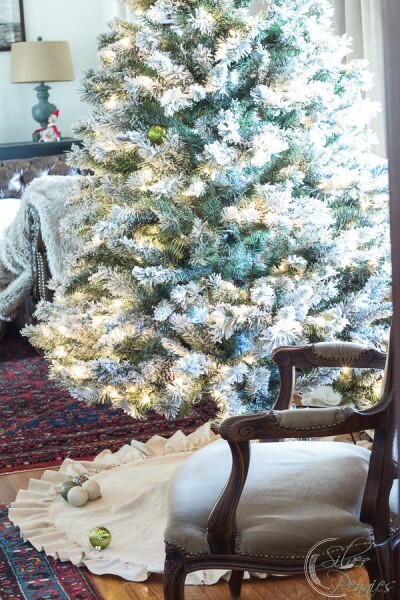 It is decorated simply with greenery and a little tree for the boys. 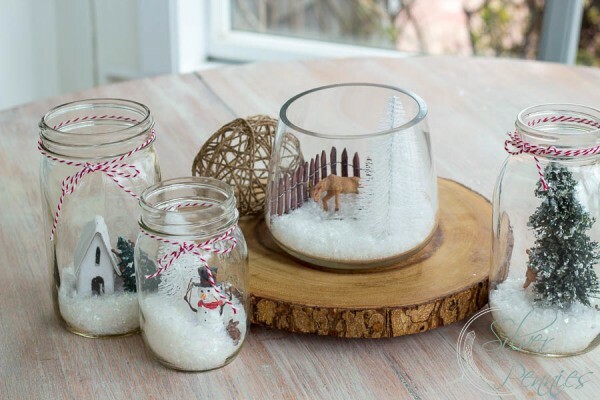 Our Mason Jar Snow Globes create a center piece. My little boys LOVED making these and we’ve enjoyed them all over the house. 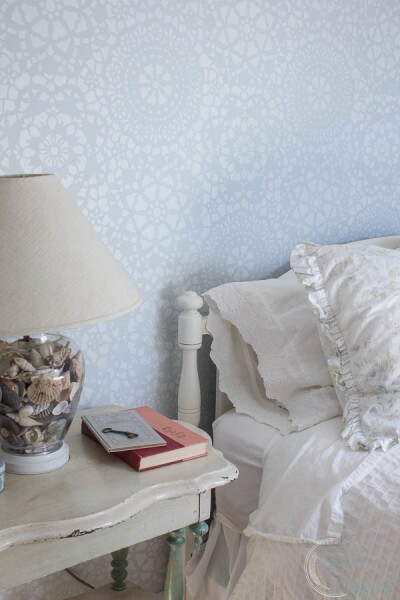 Before you go, let’s take a quick peek upstairs for a few easy decorating ideas in the bedrooms. We just finished working on our guest room last month. Phew! Lots of DIY projects in here. 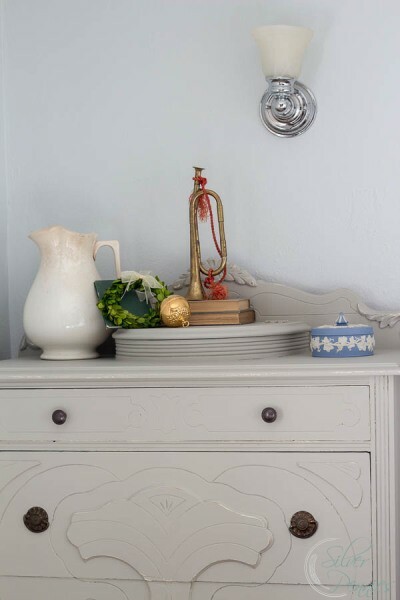 A vintage horn and a boxwood wreath adorn the top of this painted 1930s dresser. The little brass bell is from my childhood. I used to hang it on the tree when I was a girl and I’d always save it for last. 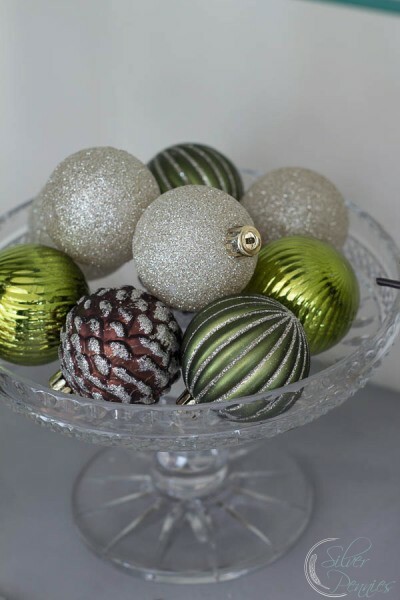 In our bedroom there are small touches of Christmas too. My husband’s armoire has a small glass bauble, more magnolia leaves and a snowy owl. 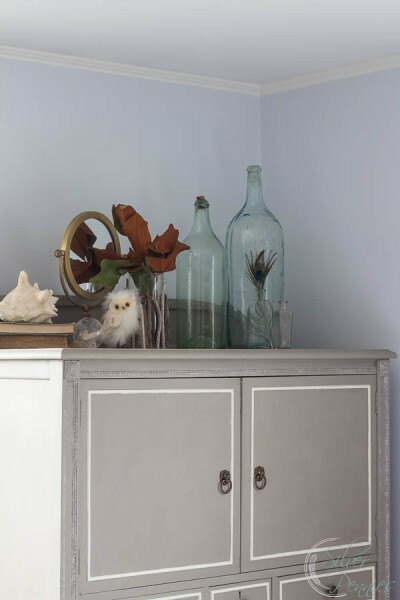 As you can probably tell, I love painted furniture, decorating with natural and vintage elements. My little vanity is no exception. 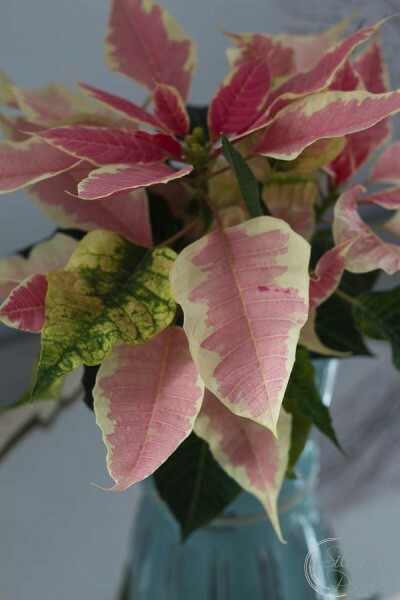 Under the sea shell mirror is the sweetest pink and white poinsettia. Well, that ends the tour of our home! Thanks so much for having me stop by, Beth! 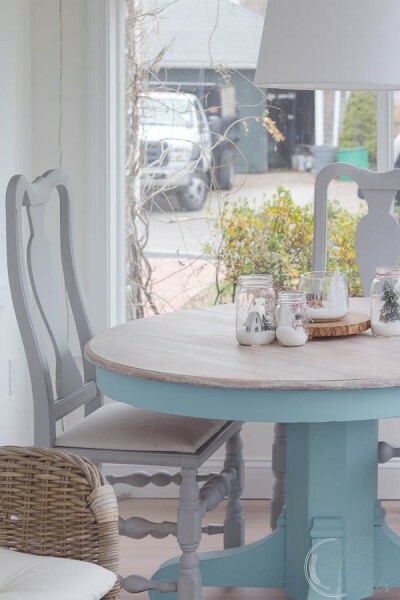 If you like painted furniture or coastal decor I hope you stop by my blog to say hi! You can also find me on Instagram, Facebook, Pinterest and Twitter. Happy holidays, Everyone! We’ll be doing more restoration on our home in 2015. Isn’t Danielle’s home dreamy? Thanks so much for showing us your home today Danielle! My grandmother’s house had a crystal doorknob (just one!) and it always felt magical to me too. I need those in my life! 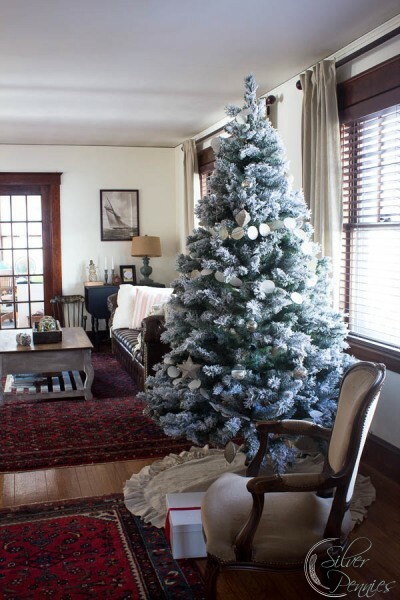 PS: If y’all want to see more decorating ideas from all the past holiday home tours, click here. Beautiful! 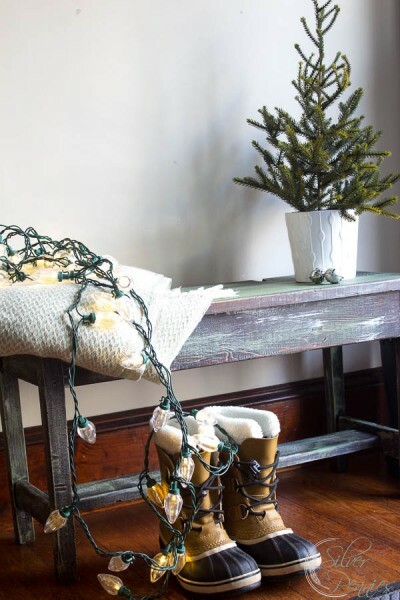 Nobody would guess that you are decorating on a budget. 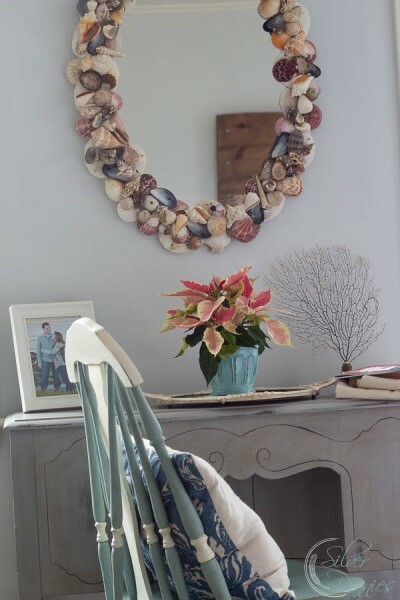 I love all of the family treasures mixed with beautiful thrift store finds and the lovely thread of blue throughout your home, Danielle! Just stunning! 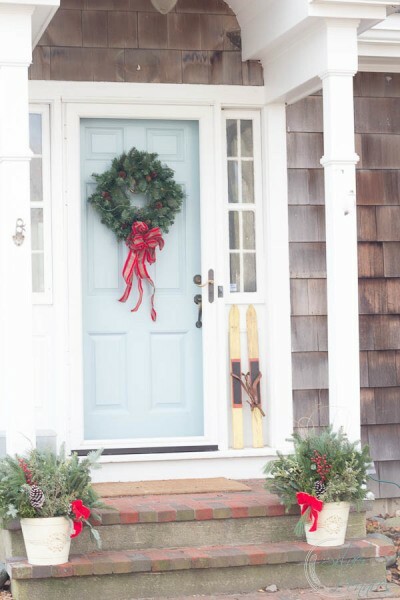 Lovely home and simply beautiful and casual holiday decorations!! 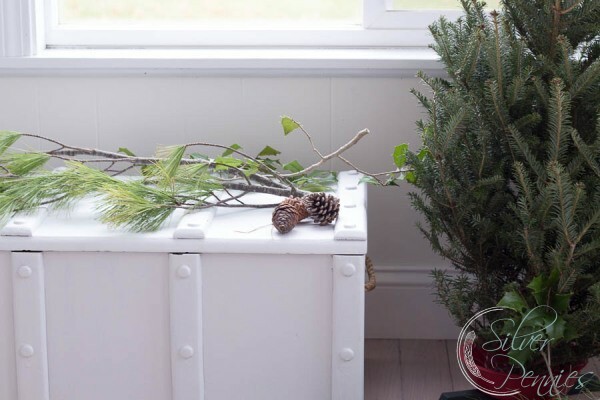 The simple touches are my favorite…the pinecones, the cute bench, the dining table. Love it all! What a beautiful home, everything is gorgeous. 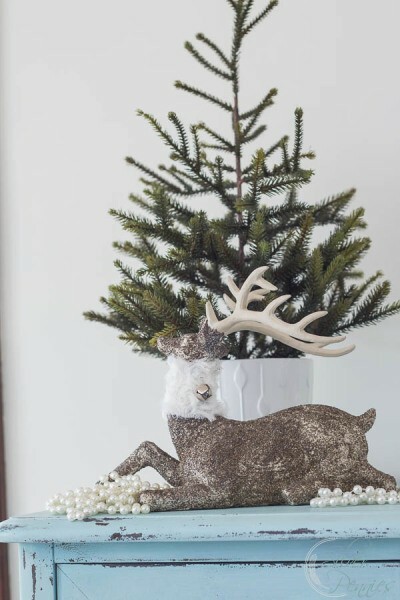 I love the glittered reindeer with the little tree! A traditional game drive isn’t the only method to come across the African animal kingdom though.